Stop me if you've heard this one before. Although the national trackers look slightly stronger for John McCain than they did a couple days ago, Barack Obama once again had an exceptionally good day in the state-level numbers. To review the national polling situation briefly: Gallup and Research 2000 moved toward McCain, and IBD/TIPP moved toward Obama; the other five trackers were essentially flat. 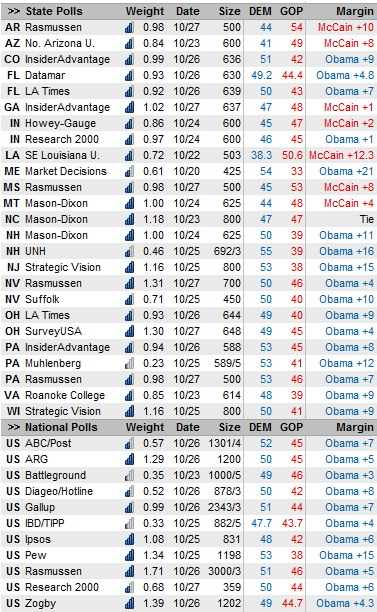 Among the one-off national polls, Pew and ARG moved toward Obama, and Ipsos moved toward McCain. I increased the sensitivity of the trendline curve today, and will continue to do so over the course of the final week of the campaign. If there is any late movement, we want to be sure that we capture it. Even so, the trendline remains essentially flat, with perhaps just a slight bit (a few tenths of a point) of retreat off of Obama's peak numbers. A brief aside about the Pew poll, which pegs the race at Obama +15. Pew has a very good reputation. Their polls, however, have also had about a 3-point Democratic lean this cycle. There may be good reasons why a poll leans a certain way; for instance, Pew calls cellphones, whereas most other pollsters do not. But a +15 from Pew isn't quite as meaningful as if, say, that result were coming from Gallup, which has been very neutral overall this year. At the state level, these numbers ought mostly to speak for themselves. We have yet more evidence that John McCain has big problems in Virginia and Colorado. And keep an eye on those Nevada numbers, because if they creep into the Virginia/Colorado range, then John McCain could very easily pull off a miracle in Pennsylvania and still lose the election. In Ohio and Florida, furthermore, which were two states that had looked to have tightened a bit, we now have more polling out showing material leads for Barack Obama. With numbers like these, John McCain has less leeway pull off the gamble that I advocated in the New York Post this weekend, essentially pulling out of Florida and hoping that the base carries the state for him on its own. Don't neglect the two fresh polls of Indiana, from Howey-Gauge and Research 2000; each suggest that the state is a toss-up, and lend a bit of stability to our Indiana estimate after some weird polling there last week. The one state where John McCain gets a comparatively good number is in Pennsylvania, where Rasmussen has him down by "just" 7 points, and InsiderAdvantage by "just" 8. Pennsylvania appears to have tightened some -- into the high single digits rather than the low double digits -- but it's still polling better for Obama than at almost any other point of the campaign.